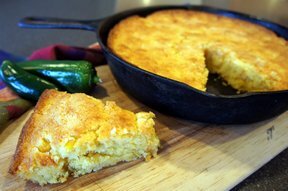 This cornbread is traditionally baked in a pre-heated cast-iron skillet to create a crispy brown crust, but an 8 x 8 baking dish will also work. Pre-heat oven to 425°. If using a cast iron skillet, put it into the oven to pre-heat. Put a piece of foil or some other oven-proof material on the handle as a reminder not to touch it without a potholder. If using a different container, wait until a few minutes before the batter is ready to pre-heat. Sour the milk: add 2 tablespoons of vinegar to the milk and set aside. In a mixing bowl, beat the eggs well. Add oil or melted butter and the sugar or honey. 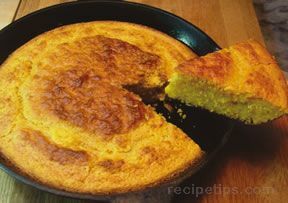 In a separate bowl, stir the Masa Harina De Maiz, cornmeal, salt, soda and baking powder together. Add the soured milk to the eggs, mix well, and stir in the dry ingredients and mix lightly. Remove the hot skillet from the oven, add oil or butter to coat the pan and pour in the batter. Return to oven and bake until set and golden brown, 20-25 minutes. Serve warm or room temperature, with butter, applesauce, or syrup. 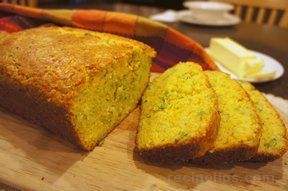 "Thank you ever so much for this recipe, Ive been paying $8 a loaf for spelt or kamut bread for my son because he cant have much gluten. Every recipe Ive come across for a GF bread corn or not has far too many ingredients that just aren't what you have in the cupboard ready, there too expensive and cost more to make than buying the loaf already made. But not yours its simple, its delicious and best of all my son will eat it. 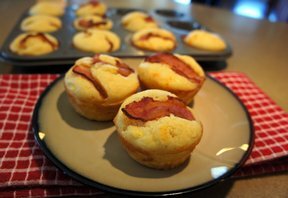 So thanx again for sharing this budget saving scrumptious corn bread recipe I'm telling the world xoxoxo"
"Perfect cornbread - tasted just like grandma used to make. Only change that I made was using buttermilk instead of regular milk + vinegar."